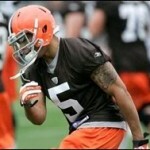 Browns’ Ryan unhappy with Haden selection? There was chatter while the Cleveland Browns were on the clock with the No. 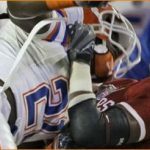 7 overall pick in the 2010 NFL Draft that the front office was heavily debating whether to select former Florida Gators star Joe Haden or Boise State’s Kyle Wilson as (hopefully) the team’s shutdown cornerback of the future. Recent comments from New York Jets head coach Rex Ryan – the brother of Brown’s defensive coordinator Rob Ryan – indicate that the latter was heavily campaigning for Wilson (who the Jets ended up picking 22 spots later). Rex Ryan has already tabbed Wilson as the team’s starting nickelback, according to The Cleveland Plain Dealer. Haden hopes to earn one of the Browns’ two starting jobs. TWO BITS: Haden slipping? Amateurs qualify. Like I was saying, Haden’s biggest mistake is that his family didn’t put him on an RV and act like buffoons every game. Can’t buy that kinda pub! That RV just screams that Boise St. mentality doesn’t it? Haden’s biggest mistake is that he went to a real program in a competitive conference, instead of a bush league junior college with blue astroturf. I dont think its even a question that Wilson would not be a “shutdown” corner if he played in the SEC every week. He’s good, but not “all world” as his highlight film makes him look. Haden’s body of work speaks for itself, especially considering the level of competition. The Browns will be glad they took Haden.